Several of us were lucky enough to attend the Sardis Raptor Center’s “Hunters of the Sky” program at Howard Miller Park on January 30th. It was very fun and educational. I learned that the golden eagle has front facing eyes (the better to hunt with) and the bald eagle has eyes more to the side (the better to scavenge with?) I snapped a few pics with the point and shoot. The bird handlers brought out the hawks and owl first. Sarah with "Tundra" the peregrine falcon. I thought the hawks seemed pretty big, but when the eagles came in it really put things in perspective. It took our breath away to see their enormous size and wingspan. Look at the size of this golden eagle! It has an 8 foot wingspan. The birds really bond with their handlers. These two were particularly cute together. "Einstein" the juvenile bald eagle was actually preening this guy's hair at one point. I was struck by how similar the feathers are on these two birds. It would be hard to ID them from far away at this angle. 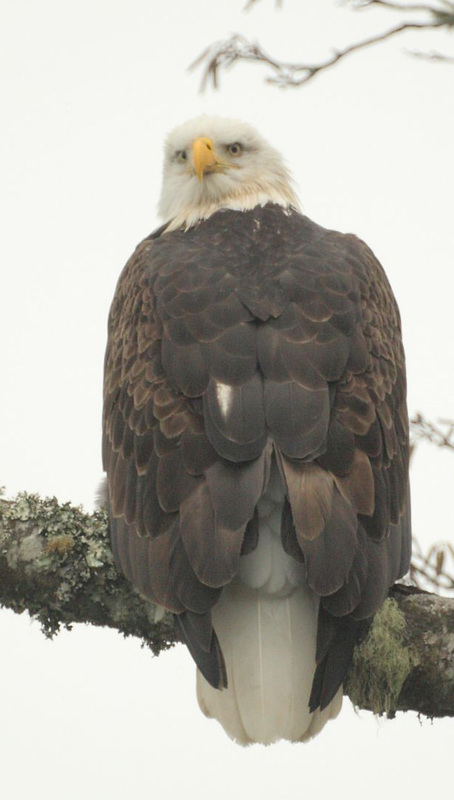 Look for the feathered legs, gold crown, different bills, and eye locations. It's a bit misleading how the golden looks smaller here. It is 14 lbs and the bald is 10 lbs. The birds in the show are permanent residents of the the center. Birds that are under rehabilitation for eventual release have no contact with the public. I’ll definitely be taking my family up to Ferndale to visit very soon. The Sardis Raptor Center is open Saturdays from 11-4. Here’s a video Scott took near the Hatchery a couple weeks ago. Isn’t the dipper fun to watch? I think I’m going to call this the season of the dipper.